Home Technology Product Family i-tour Download Support F.A.Q. 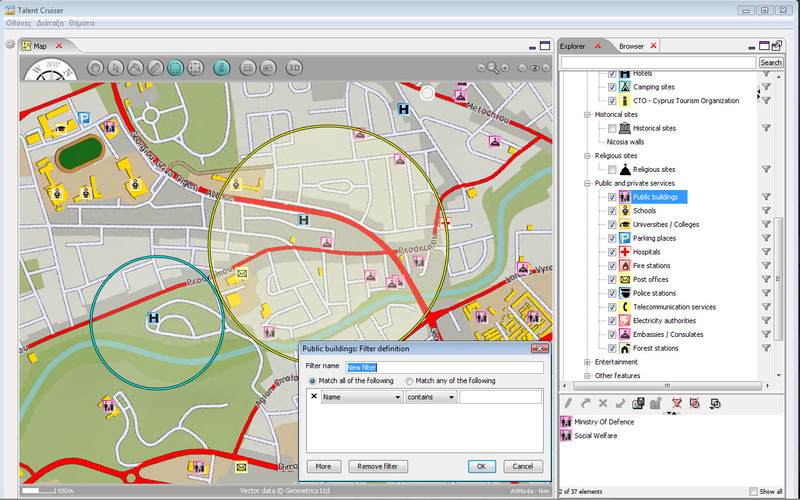 Cruiser is a Java-based platform for creating feature and experience rich geo-information applications for Geo-Portals, On-line communities, Location-based directory services and advertising, Tourism, Real Estate, Fleet Management & Tracking, Navigation, LBSs, Media, Education, Local administration, Safety and Risk Management, Environmental management, and more. If you are a Solution Provider or Web designer read on how you can benefit from neat Cruiser-based solutions. If you are a web user just browse and enjoy Cruiser-based products and services. 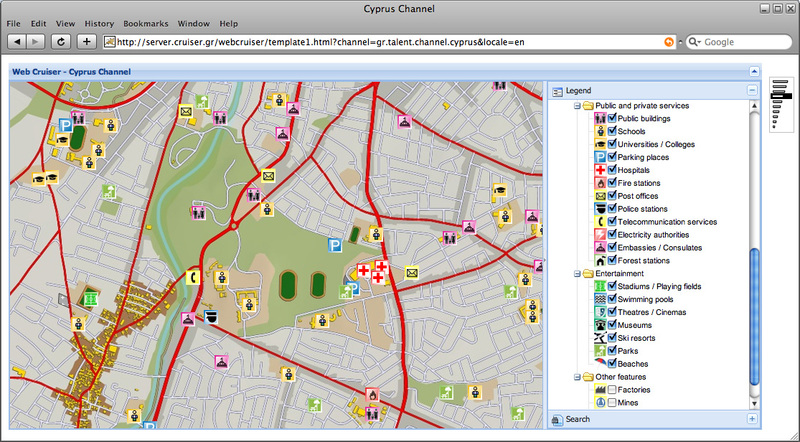 Create Cruiser powered geo-portals offering location-specific directories and promotional ad-banners. 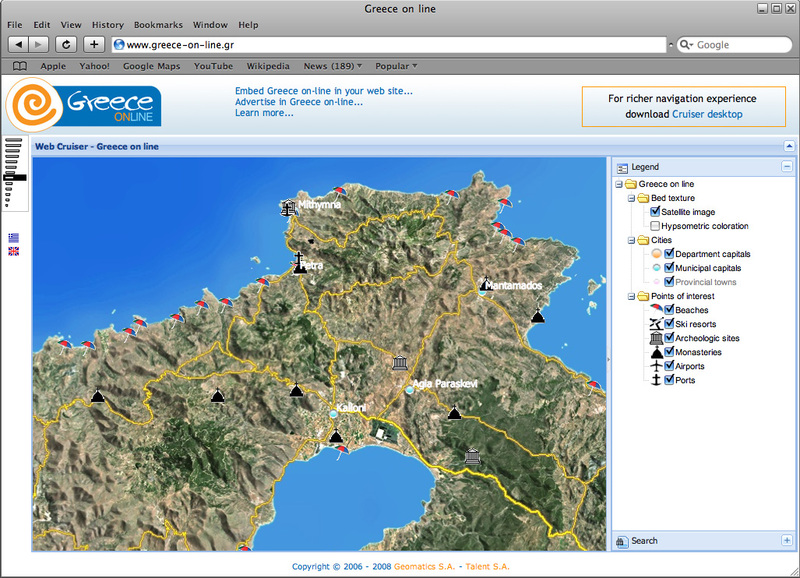 Visit Greece on-line for an example. Talent Cruiser offers all the required functionality for operating geo-portals that publish and manage geo-coded Real Estate listings and classified-ads. Create live local communities based on the contribution and sharing of experiences, stories and 'local wisdom' among members, with reference to map locations. 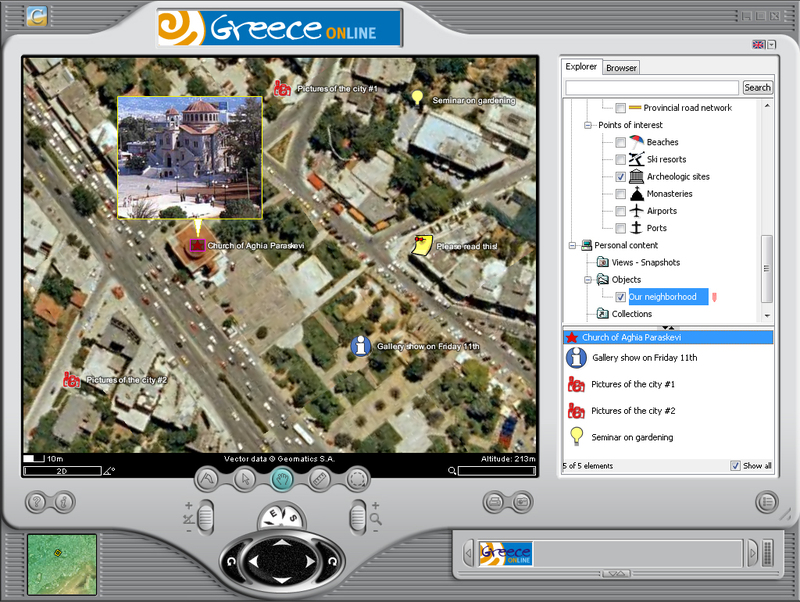 Cruiser powered tools can provide on-line and off-line navigation facilities, dynamic routing and management of traffic information coming from various sources. 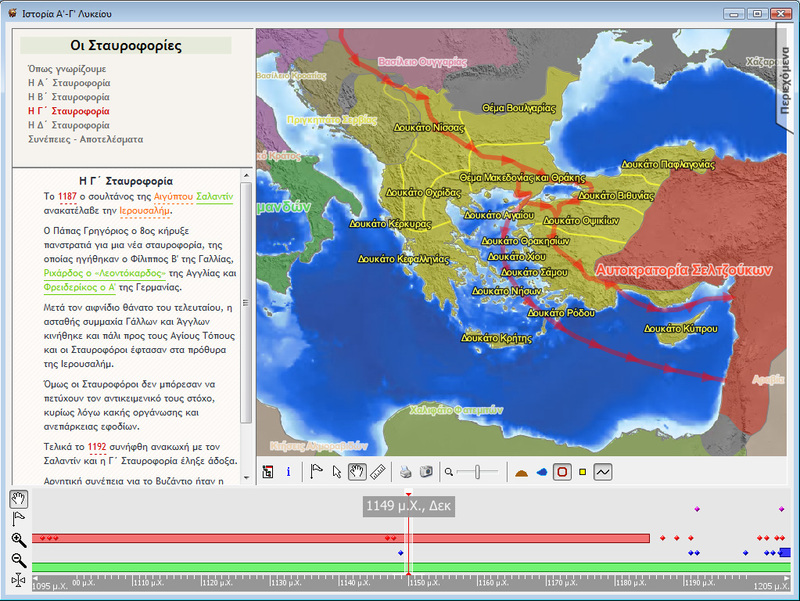 Talent Cruiser is the underlying engine of 'mind tools' for Geography, History and Math, combining interactive maps, texts, time lines, globes, graphs and simulations. 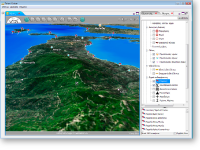 Cruiser-based interactive maps are best suited for delivering dynamic displays and animated effects in TV news, sports and media shows. 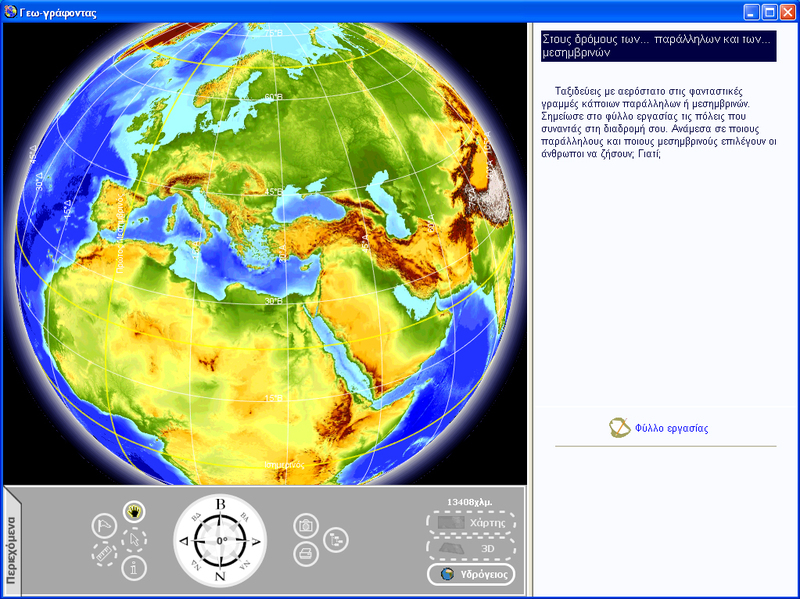 Cruiser can support simulation games in space and time, so that collaborative and engaging game scenarios like 'treasure hunt games' can be implemented. 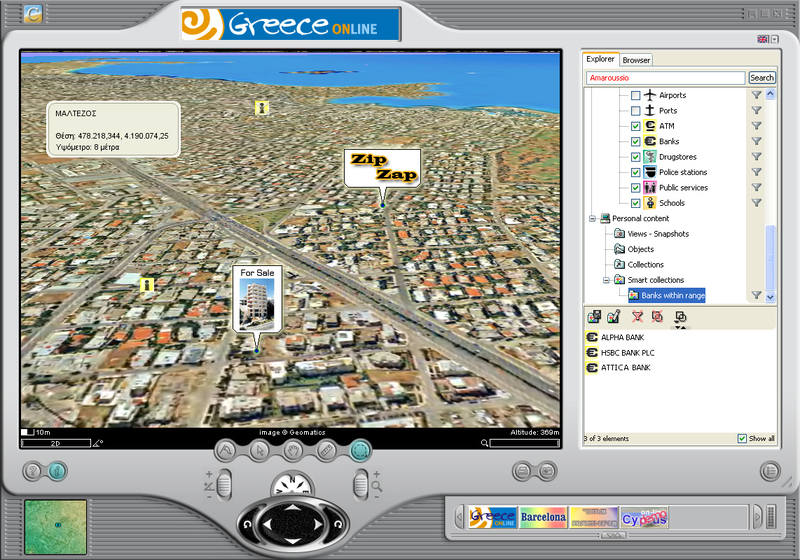 ...or through desktop Cruiser, the freely available rich client equivalent, that offers advanced user navigational experience (fast streaming, 3D flyover, and more. 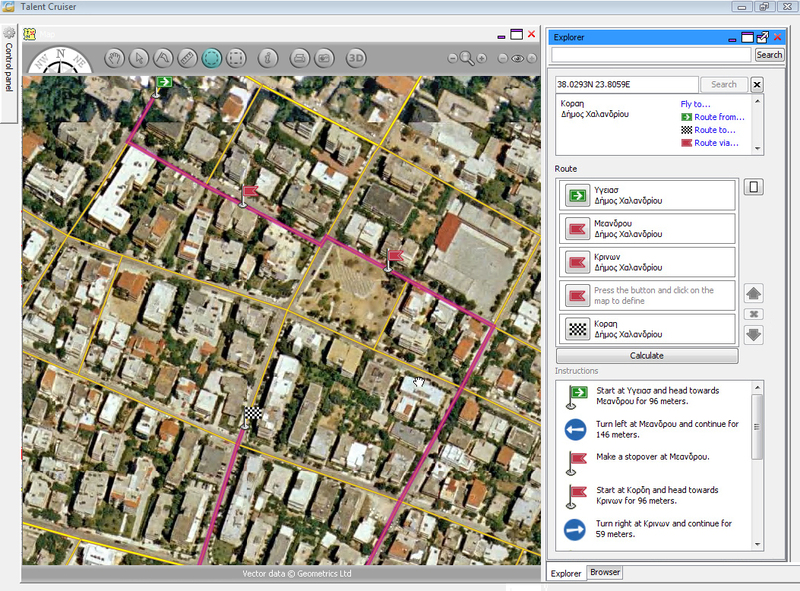 Cruiser powered maps offer simple tools for creating and annotating your own content on the maps. 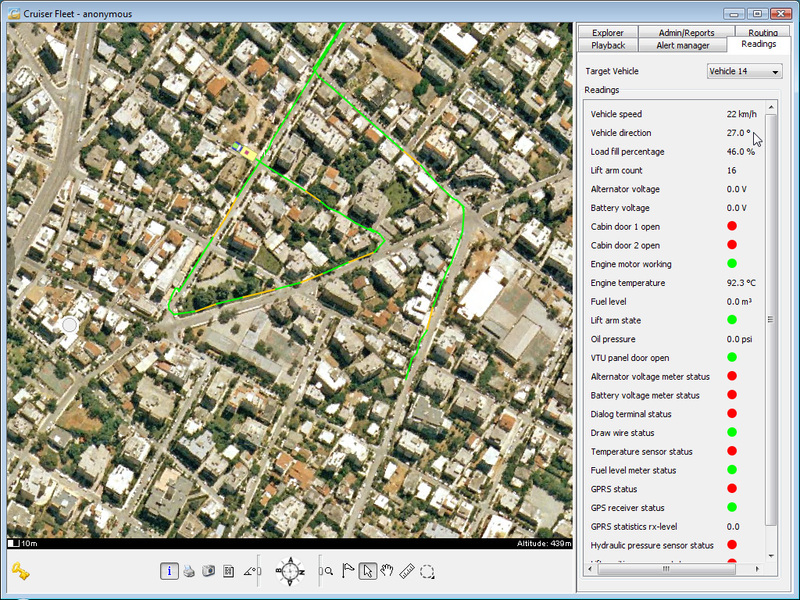 Once you have created your Cruiser content on your maps, save it for future use, share it with others, or publish it on the web for public view. 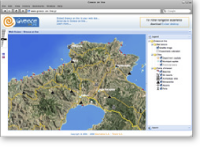 The Cruiser platform offers the ability to point to any location of interets in Cruiser powered maps through simple HTML tags that can be used from any web page. The Cruiser platform offers the ability to embed Cruiser powered maps (published either by you or by others) in your web pages or portals, so that you augment the experience of your visitors. 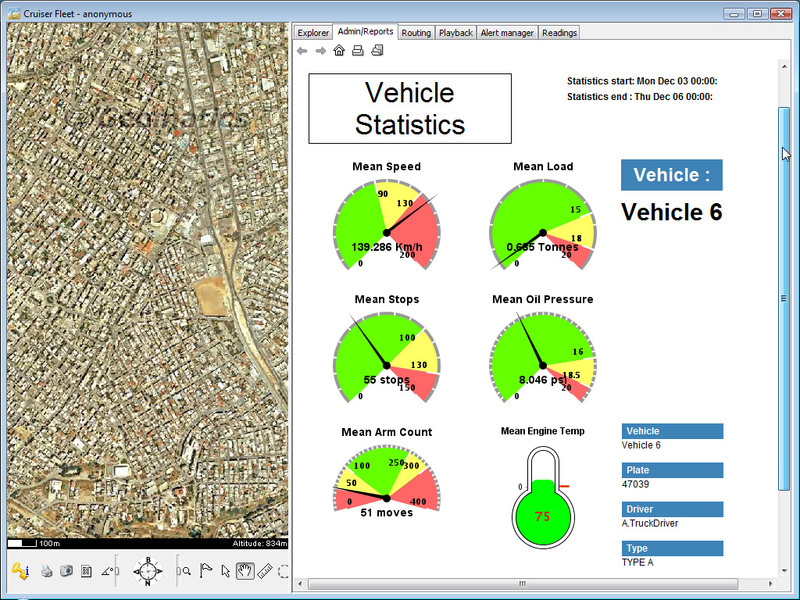 Cruiser Fleet provides a state-of-the-art fleet management solution capable of tracking and managing fleets of vehicles, personnel, or moving assets. Augment your CRM and sales force management tools with spatial reference, locate your clients, plan your visits, mark your notes and edit your client records directly on the map. 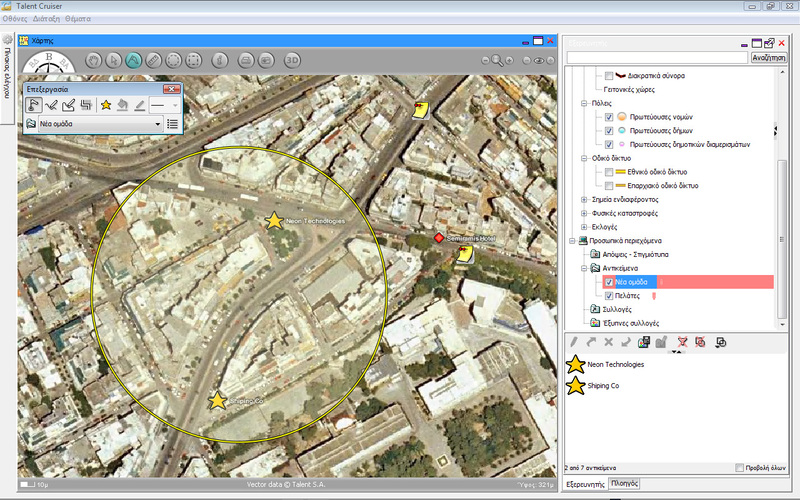 Cruiser provides tools for viewing, quantifying, measuring and spatial analysis of various indicators directly relating to marketing decisions, like proximity of sales points to targeted customers, competitor positioning and presence within the areas of concern, area demographic data, customer transportation habbits, etc. Cruiser-powered systems can deliver all the required functionality to support the management of assets and property of organizations, being either moving or fixed. 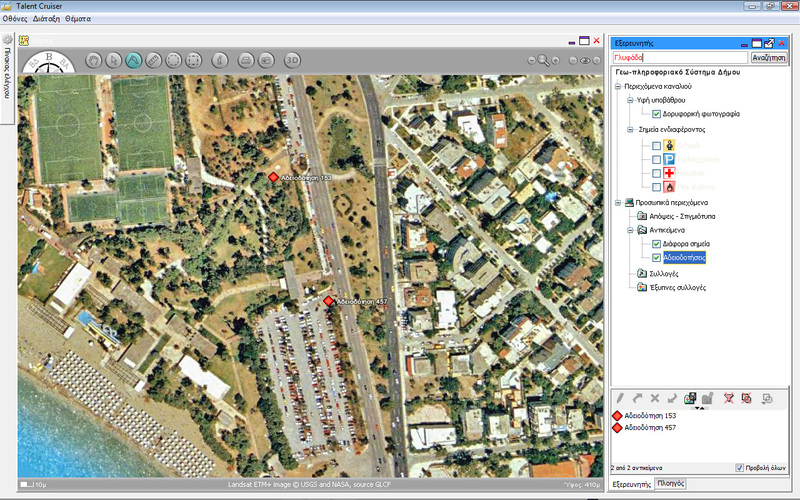 → Easy creation of geo-databases of assets' locations either via geo-coding or by direct input on the map. 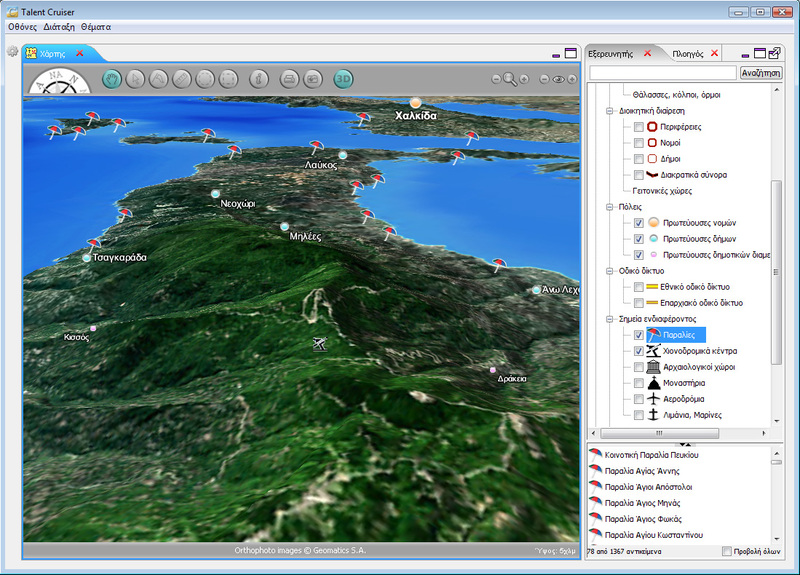 → Spatial browsing and navigation, visualization of assets. 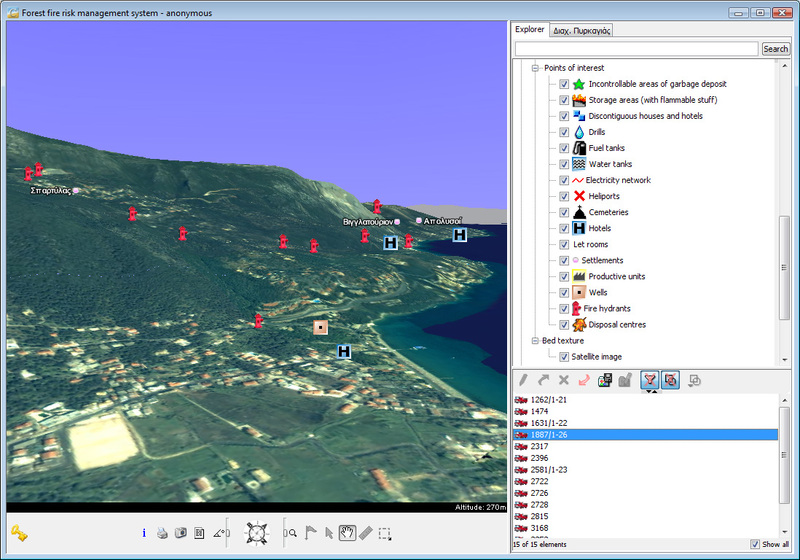 → Searching of the databases and locating assets by using with spatial filters, spatial or attribute criteria and rules. → Full database and property editing capabilities in group and multiuser environments. 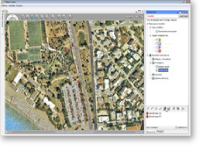 Cruiser Polis provides a tool for the geo-spatial planning and management of Municipal property, land use, cadastral, fleet of vehicles and filings. 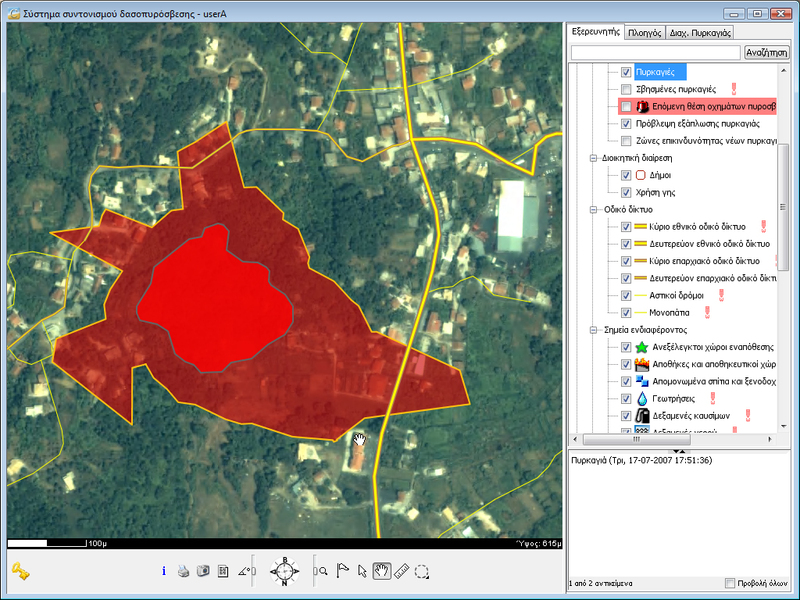 The Forest Fire Risk Management System provides visualization, decision making and prediction tools for coordinating the combating of fire incidents. 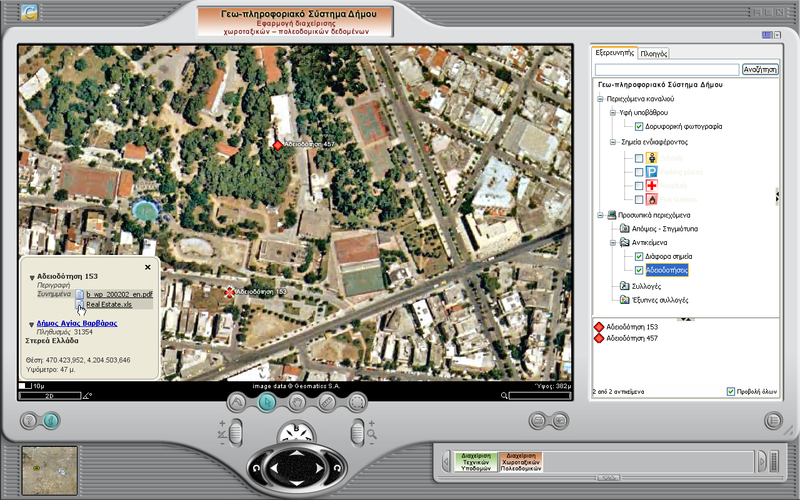 → Environmental monitoring through spatially distributed sensors, visualization of the spatial distribution and density of environmental parameters (e.g. pollution in air, soil, water) and model-based predictions of the evolution of phenomena. → Management of planting, fertilizing and irrigation based on soil types and historical records of farming in time, taking into account weather conditions.